We have entered the 40 days of the Lenten Season with today being day 5. Lent is a time where we turn our thoughts to what Christ has done for us through His sacrifice on the Cross. 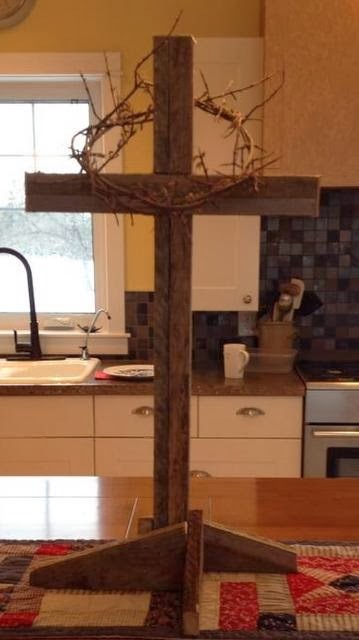 My dear friend Joy has this wooden cross set up in the center of her home in the hubbub of her kitchen. It is a constant visual reminder of Christ's sacrificial love for us ALL. Many people regardless of their denomination of the Christian faith observe Lent by giving something up or developing a spiritual discipline, so that they may have a closer and more meaningful relationship with God. Regardless of how you observe Lent, my prayer for you is that God will draw you closer to Him and prepare you for a fresh and new experience of what Good Friday and Easter really means. How do you observe Lent? May God's peace be with you throughout the Lenten season. A beautiful visual! We were reminded this morning that it's a time for Spring cleaning - of the heart and soul. I've been challenged to do this and to keep my eyes on the cross as well. Thank you. I really like the idea of the cross on display for lent! We give up meat. But last year my husband ended up ill, so we're going to keep fish in the diet this year, even though I do supplement with soya products and nuts and such. I am so glad I have a gracious and forgiving God, because on day one I went to the shop all excited to buy our vegetarian fair, and promptly bought a salami roll for lunch, not a blink until I'd already eaten some of it. On day two, while getting ready for our fish day, I was suckered (asked nicely by the promotions lady) to try a piece of ostrich steak that had been cooked in some lovely sauce. I didn't even hesitate. Ugh! I'm a work in progress. I don't normally engage in an official activity for Lent, but this year, I did commit to seeking God and spending time with our Saviour before I indulge in my own relaxation or leisure activities. When I return home from work, before I can pick up my favourite novel or turn on the TV, I'm picking up my Bible. It's only been a few days, and already I am grateful for the renewed diligence.